walking away from a relationship that has become stale or wearisome. 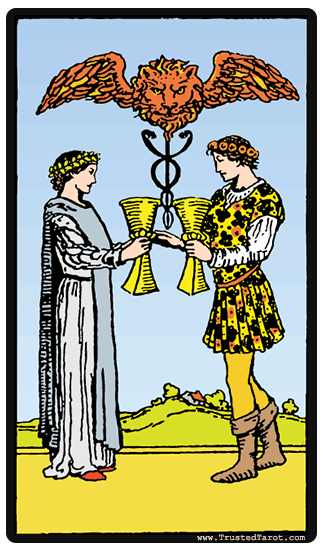 This card shows an image of a man and a woman that are exchanging their cups in a ceremony. There is the symbol of Hermes caduceus in between which is often related to negotiation, trade, cosmic energy, protection, proper conduct, and duality. The Two of Cups refers to something quite positive, for it is one of the most auspicious cards in the tarot for relationships, whether romantic, business or otherwise. It suggests a new partnership is in the works, and it will be created with balance, respect, and honor. Above the caduceus is a chimera, which symbolizes fire and passion also governs this partnership. 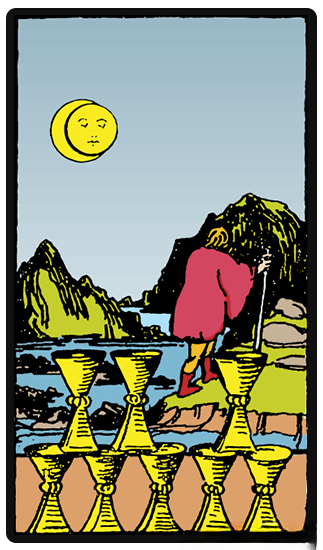 The Four of Cups displays a young man sitting under a tree on a mountaintop, far from others. He seems to be in contemplation and meditation. 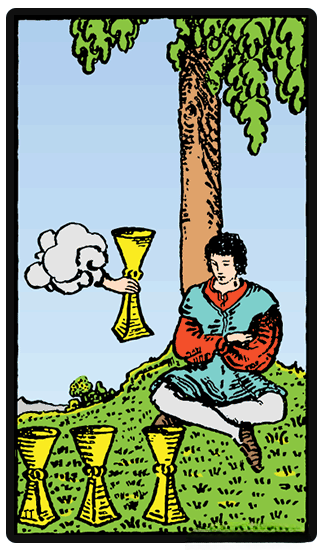 In front of him are three cups laying on the grass while another cup is being offered to him by a hand in the air. The man has crossed his hand and legs, and he is looking down at the three cups, unimpressed, such that he cannot see the cup being presented to him by the stretched arm. The Four of Cups represents our tendency to take for granted the things that we have, making it hard for us to see what treasures the universe presents us with. We tend to have the answers to our troubles right around us, but we tend to focus too much on what we do not have. In the Eight of Cups, we are confronted with the moment of transition. We see a cloaked figure taking off to a barren land leaving behind eight golden cups. He is tired of what those cups that he has spent so much time collecting, and is now setting out to seeking a higher purpose. It may be a result of a boredom or unhappiness that comes with realizing that whatever they have been looking for in life isn t as pleasurable or as satisfying as they once assumed it would be. The person undertaking this journey might also signify be seeking excitement in the unknown. The mountainous barren lands that he sets off to can also be symbols of facing new challenges. Their stark emptiness seem to indicate that they are waiting for one to come and shape the. The journey that is taken can be done in the guise of trying out new things that have the potential to help one grow both mentally as well as spiritually. It also shows the willingness to detach oneself from others so that one can work on self-improvement, self-understanding and growth. enjoyment of leisure after hard work. In certain circumstances can represent farming, with Ten of Pentacles and Empress could represent a farming family. leaving an old path to explore a new one that seems more exciting, similarly Aces represent pastures new. abandoning a course without completion, or not staying long in new employment.